peeta<3. . Wallpaper and background images in the Đấu trường sinh tử club tagged: katniss peeta games the hunger games. oh cool! though i think that katniss would name prim, rue. I never really thought about her kids name, did we ever find out? Ummm, I think you got it wrong. 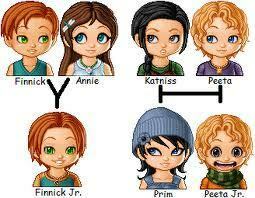 If you had read the book, you would know that Annie and Finnick didn't have any children. The drawings are cute though. ugh!!! they had one kid but finnick died before he was born? oops i meant to put an exclamation mark not a question mark. cupocinno if YOU read the book, you would know that finnick and annie DO in fact have a little boy. and this is so cute!! They look super cute- exactly how I imagined it! i think peeta and katniss' childrens' names are isabel and charlie cuz in the acknowledgements it says, "and thanks to my wonderful children Charlie and Isabel and all the love and joy they bring me."